Notes: The colour of the disc is sliver with no title information on it beside basic copyright information. After the last song on the album, Antistar, there is an secret hidden song that plays exactly 30 seconds after Antistar has ended. This hidden track has no name and there is no indication on the album sleeve or booklet of this hidden track's existence. 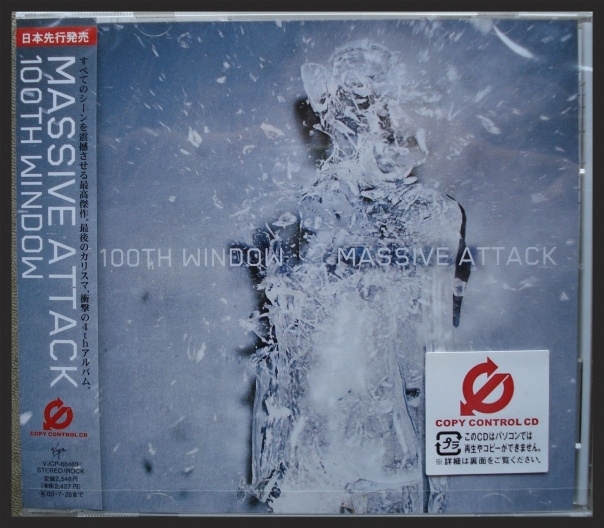 Notes: The colour of the disc is sliver with no title information on it beside basic copyright information. The disc itself contains copy control protection. 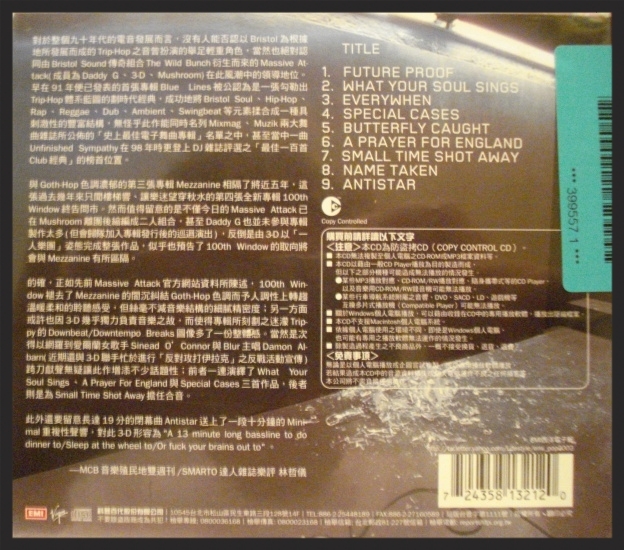 After the last song on the album, Antistar, there is an secret hidden song that plays exactly 30 seconds after Antistar has ended. This hidden track has no name and there is no indication on the album sleeve or booklet of this hidden track's existence. 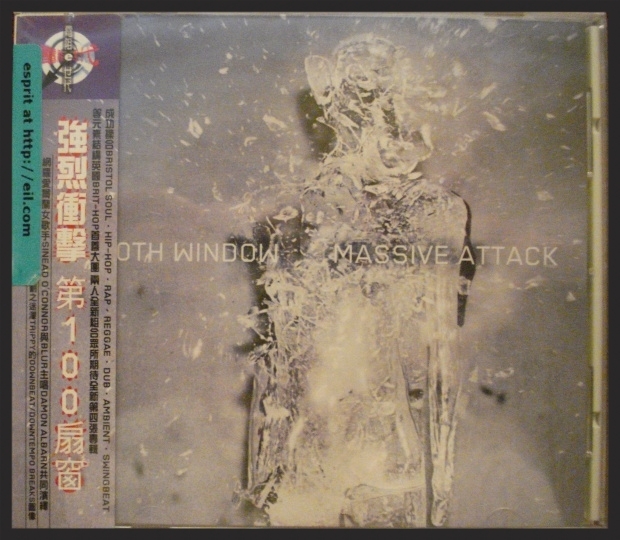 Notes: This is a very unique promo among all of Massive Attack's promo releases and also exceedingly rare, with less than 50 of these being produced. 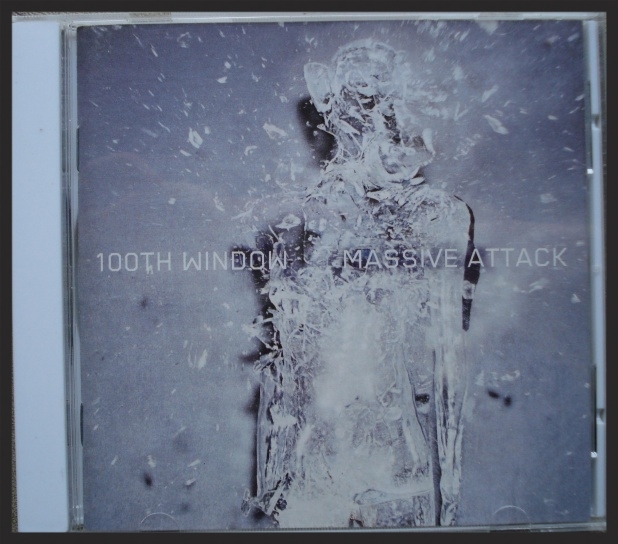 The glass box is composed of two parts, with the bottom part having a hollow portion to fit the 100th Window album. 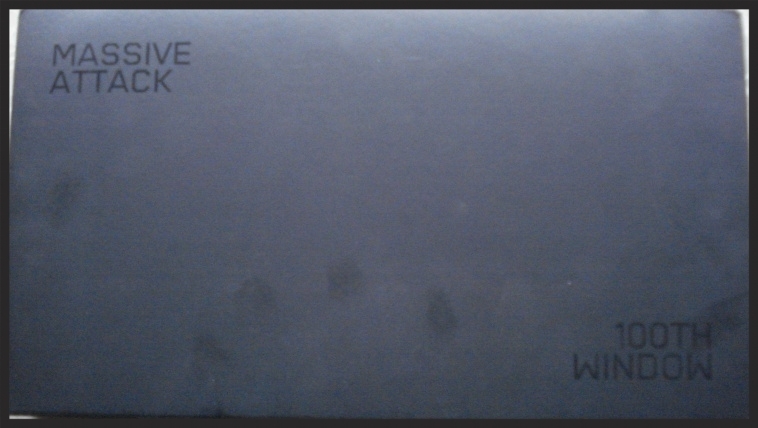 The album jewelcase is also wrapped in a plastic sheet with the words "Nouvel Album" on the front cover. 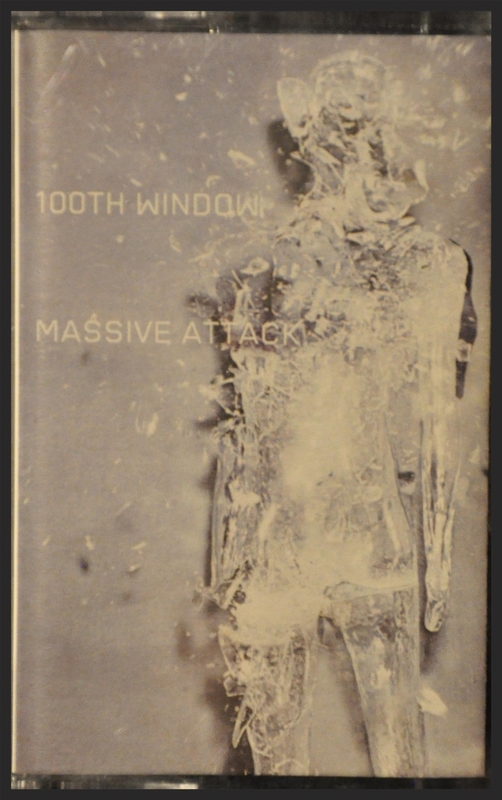 The glass box is also engraved with the words "Massive Attack" in top left corner and "100th Window" in the bottom right corner. Finally, a black cardboard slipcase fits around the glass box which has the record label name Delabel printed on the bottom of the slipcase. 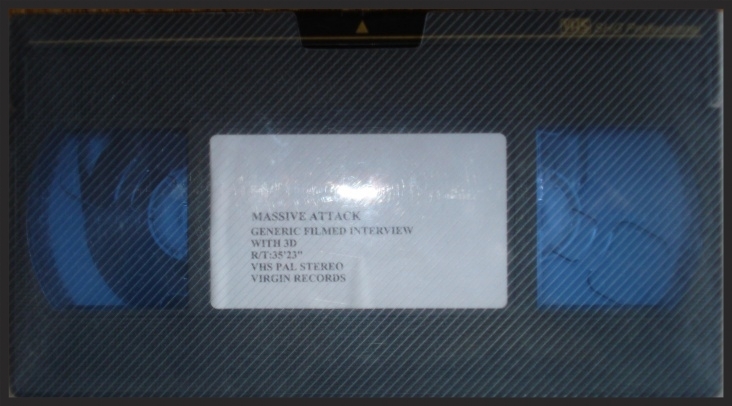 Notes: The sticker on the the VHS itself proclaims this to be a "Generic Filmed Interview With 3D". This was produced to give journalists an idea of the concept behind 100th Window and on how it was produced. The interview itself was also released publicly on the internet for all to view. Notes: This VHS was produced by Toshiba EMI for the Japanese music press. It contains roughly 5 minutes of promo "blips" featuring images of the shattering glassmen set to ambient music samples from 100th Window. This particular VHS is in the NTSC format. Notes: The colour of the disc is black with no title information on it beside basic copyright information. The disc itself contains copy control protection. This promo contains a different version of Future Proof as it is slightly extended with two additional beeps at the very beginning of the song. Notes: This is a audio recording of an interview between 3D and a journalist named Sally Stratton that was recorded in December 2002, where she quizzes 3D about the then upcoming release of 100th Window. The journalist's voice does not feature on the CD; it is just 3D answering the questions, she presumably just asked him. Listen to the entire interview on YouTube.